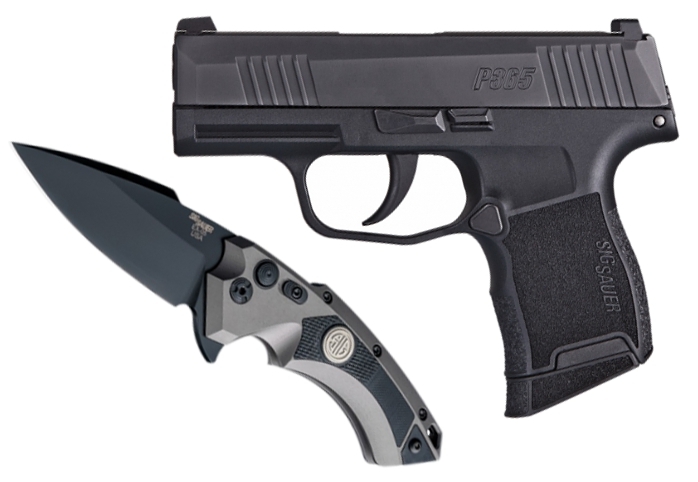 Introducing the game changing Sig Sauer P365 ($600). Micro-compact everyday carry size with unprecedented 10+1 full-size capacity. The P365 is striker-fired, with the clean crisp trigger pull you expect from a SIG. Lightweight and easy to conceal, the P365 is chambered in 9mm and is rated for +P ammunition. Included standard are XRAY3 Day/Night sights, a 10-round flush fit magazine, and a 10-round extended magazine. An optional 12-round extended magazine allows you to bring the total capacity to 13 rounds. The new P365. Bring More. Everyday. The distinctive X5 3.5" SIG Tactical Folder ($249.95) from Hogue offers effortless opening action without the aid of a spring. Utilizing Hogue's state of the art deployment technology, the flipper opening blade rockets into open position and locks firmly in place. A sliding safety adds an extra level of blade security when in the open position. This Allen Elishewitz design provides easy one-handed opening and closing and a comfortably contoured handle. Item includes an ergonomic pocket clip, that is reversible for left or right-hand carry.